In the past, most of the innovation came from bottled and canned beverages. However, in recent years, there has been a lot of innovation and a surge in the popularity of fountain beverages overall, and frozen carbonated beverages, in particular. For retailers, the timing couldn’t be better. Not only are frozen carbonated beverages incredibly popular, but the technology is more reliable than ever, drink combinations can be easily swapped out to meet changing customer demand, and frozen carbonated beverages offer impressively high profit margins (up to 70%!). 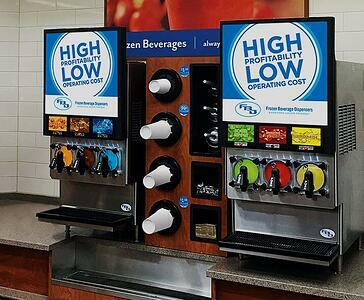 A frozen carbonated beverage machine works in a similar way to a regular fountain soda machine. Flavored syrup is mixed with water, and then carbon dioxide (CO₂) is added to give this mixture its signature bubbly, crisp texture. Frozen carbonated beverages machines add one more step to this process: this mixture of syrup, water, and CO₂ is then injected into a cylinder surrounded by refrigerant that chills it down, often below the freezing point of water. While water alone would freeze solid quickly under such temperatures, pressure (up to 40 P.S.I. ), sugar, and CO₂ all combine to prevent the mixture from becoming a solid block of ice. When this mixture is dispensed into a cup, the pressure is released, allowing ice crystals to rapidly form and expand, giving frozen carbonated beverages their smooth, fluffy, foam-like consistency that customers have grown to know and love. 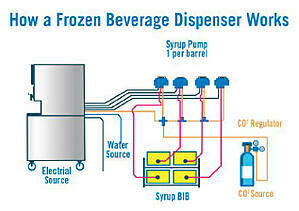 A frozen carbonated beverage program brings you up to 70% gross profit! In fact, the profit margins of frozen carbonated beverages are up to double that of canned beverages and potentially 20% higher than fountain drinks. 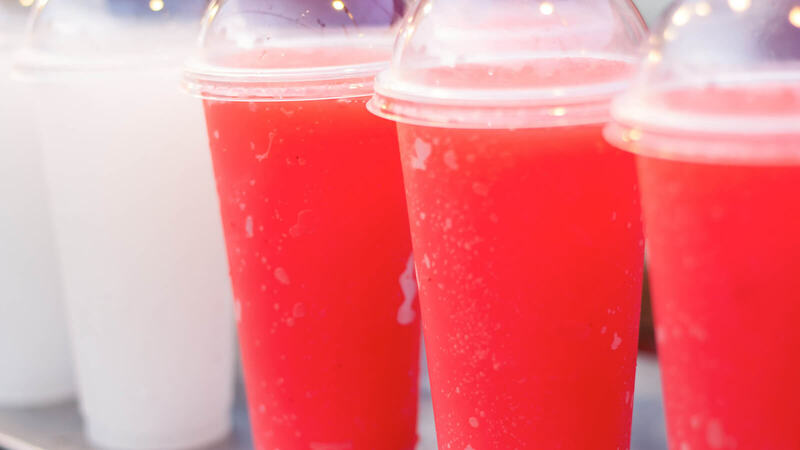 In comparison to fountain drinks, frozen carbonated beverages benefit from higher price points and less promotional expenses, especially during the summer. This extremely high level of profitability is mostly due to the fact that 50% of a poured frozen carbonated beverage (FCB) drink is CO₂ (air) and 40% is water. 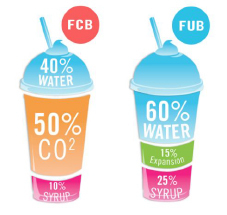 In comparison, a frozen uncarbonated beverage (FUB) from an open bowl system is 60% water, 15% expansion, and 25% syrup. Without carbonation, syrup usage increases and profits decrease. Frozen drink products that require milk, such as ice cream products or the yogurt in smoothies, are even more expensive and less profitable. Reliable and Easy to Operate: Bag-in-box syrup packaging makes it easy to refill machines without making a mess mixing product or taking them offline for time-consuming and labor-intensive sanitation routines. Common serviceable parts are accessible from the front of the unit, making servicing quick and easy. In addition, each unit is equipped with built-in diagnostics to help operators troubleshoot and service equipment with ease. Lower Downtime: Keep the water on and the syrup and CO₂ full, and your machine can pour frozen drinks for a whole year before you have to do any routine maintenance on it. The main reason units can go a full year without maintenance is because it is a closed, sealed system with a stainless steel cylinder and high acid product which, combined with CO2, will not allow bacteria to grow. In comparison, open bowl systems must be cleaned and maintained weekly, leading to dramatically higher downtime and lost revenue. Advanced technology keeps our machines machines running efficiently with minimal upkeep. Higher Capacity: Even a smaller dispenser, such as the FBD 37X series, can pour 105 cups per hour compared to only 48 cups per hour with a standard, open bowl system. Running out of product means lost revenue and lower profitability. Higher capacity dispensers ensure you have enough product during peak times with high foot traffic and customer demand. Higher Durability: Our FCB machines are built with high-quality materials and parts, and are designed to last 7-10 years. 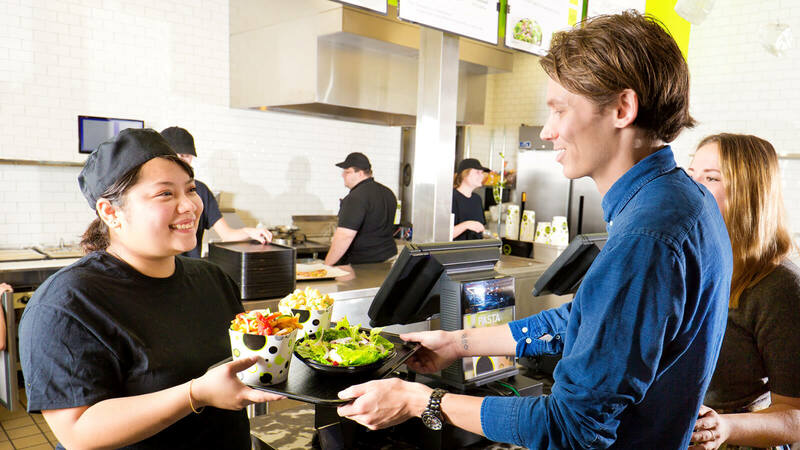 In comparison, an open bowl system will only last 3-5 years, on average. Exciting Flavor Combinations with On-Trend Ingredients: 37% of teens and millennials choose a store location that allows them to customize colors and flavors, according to the Coca-Cola FCB Flavor Exploration Study, 2015. Eye-Catching Marketing Materials in High-Traffic Areas: Whether its an attention-grabbing, branded dispenser, displays at the point-of-sale, promotional signs and window wraps, or even branded cups and lids, frozen carbonated beverages give you a plethora of new ways to stand out and drive foot traffic to your store. Ready to learn more about starting your own highly-profitable, Frozen Beverage Program? FBD Frozen is trusted by 80% of the world’s frozen beverage retailers. 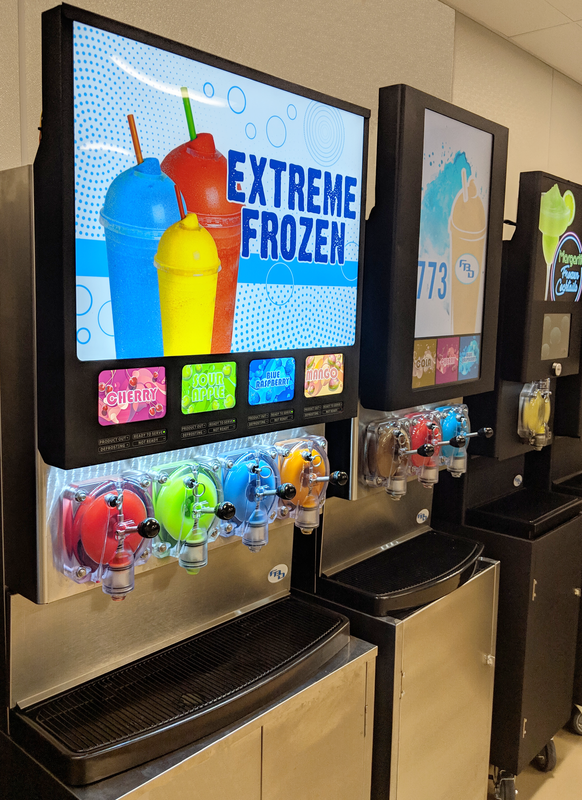 Whether you run a movie theater, a convenience store, a quick serve restaurant, a bar or an institution, we have the reliable equipment and responsive support team to help you get your profitable frozen beverage program started today! Click here to see how we can help your industry!